The Bird of Paradise or crane plant is a plant that bears a unique flower that resembles a bird in flight. Madeira Islands and Juan Fernández Islands off the coast of Chile. though these names are also collectively applied to other species in the genus Strelitzia. gray to green in color, extending up from its base. which sits horizontally at the top of a long stalk and forms a sheath that protects the flower. The color of the spathe ranges from green to purple. It makes a durable perch for holding the sunbirds which pollinate the flowers. consist of three brilliant orange sepals and three purplish-blue petals. Two of the blue petals are joined together to form an arrow-like nectary. When the sunbirds sit to drink the nectar, the petals open to cover their feet in pollen. 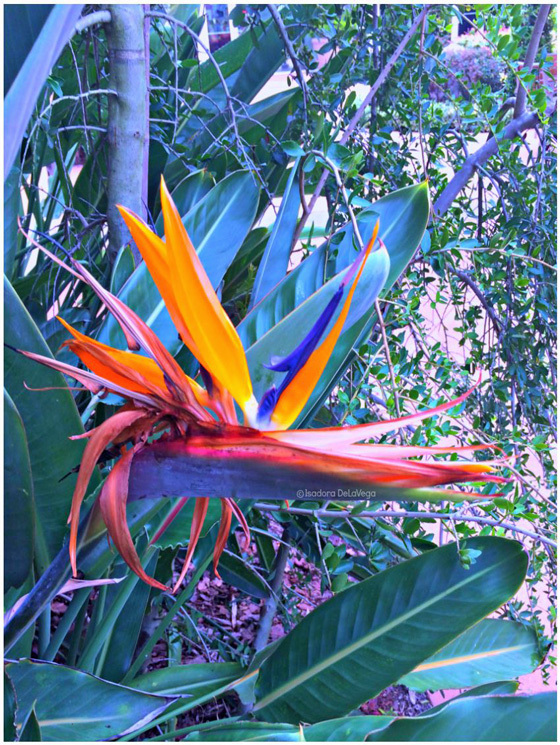 Categories: Art, My Photo's, Photography, Writing | Tags: ART, Bird pf Paradise, Crane Flower, flowers, nature, PHOTOGRAPHY, plant, quote, Strelitzia, Thich Nhat Hanh | Permalink. I have one in my backyard (Florida) but the flowers aren’t colorful. It must be lacking a nutrient. Nature creates wonders. I found it fascinating that birds use the flower as a perch. I thought the photo had a magical feel too. I hadn’t thought of fairies but they would look delicately beautiful. I actually thought it was an odd looking bird when I first saw it, Isadora! The plant does look odd. I had to really look at it to appreciate it. The colors won me over. These are such wonderful flowers. Nature creates such miracles! Nature is amazing. I like the idea of the birds perching on the flower.